L.-r.: Jim Fisher, Armando Valdes, Aura Vasquez, Abel Salas and Armando Telles at Fisher's Culver City home to load supplies. I had no idea how I would get there, but I knew I needed to be in North Dakota. Unforeseen, a visceral tug had alerted me loudly, telling me to make a move and do it soon enough to see the sky over Standing Rock by Thanksgiving Day. It was imperative, a manda I could not escape. Before Día de los Muertos, I’d begun mulling over the irony of celebrating a holiday inspired by the Mayflower pilgrims while the Lakota Sioux water protectors and their allies engaged in peaceful prayer were being shot with rubber bullets, attacked with dogs, tear-gassed and sprayed with cold water in sub-freezing temperatures. But I suddenly felt compelled, guided by unseen hands, toward the Oceti Sakowin camp. Yes, it is true that I was, by early November, already considering how to capture the ironic nature of the harvest celebration in light of the situation on the Standing Rock Sioux Reservation with an article. And it’s also true that I shared my desire to write about the callousness of this year’s feast-day observation with friends, offering the title I’d come up with for a story I hadn’t even started, as a way to gauge their interest. “From Plymouth Rock to Standing Rock”—a phrase I arrived at independently weeks before Neil Young and Daryl Hannah posted it on social media and uttered in on camera, believe it or not—polled well among them. It supported the premise that sitting down for traditional turkey and dressing to express gratitude made absolutely no sense when descendants of the first Americans were being arrested and locked in dog kennels, their ceremonial sites bulldozed before them along with the heirloom spiritual artifacts and objects used in prayer. In all honesty, the article I felt coalescing inside me did not demand a mad winter dash to the site of the proposed Dakota Access Pipeline that would pump petroleum through the ground directly underneath the Cannon Ball River, exposing an important environmental resource and natural habitat to inevitable contamination. A pipeline rupture or leak threatened not only a precious tribal water supply and the lives of the Lakota Sioux themselves, but also the lives, health and safety of millions downstream. But everyone already knew this. So being there was not likely to result in an exclusive scoop or an epic revelation. Nor would it illuminate the actions on the ground and the issues surrounding them with any additional clarity. The pull exerted upon me by Standing Rock had to be something else altogether, from a deeper well, perhaps. The truth is that I have a 20-something nephew legally named Tatanka Yotanka, Lakota for Sitting Bull. His mother, my younger sister, traveled to the Pine Ridge Reservation in South Dakota while still a teenager and spent two weeks there as part of a youth summer program developed with input from legendary Chicano poet raúlrsalinas. As a junior in high school, I had been introduced to Raúl not long before my sister Patricia's first trip to a reservation at a Native American film festival he organized in Austin to benefit the Leonard Peltier Support Group, headquartered briefly in the small bookstore he had opened on the East Side of our mutual hometown after decades on the Red Road as a poet, international Native American spokesperson, human rights activist and youth advocate. Incarcerated himself for extended periods during the ’50s and ’60s, Raúl had become politicized in prison, espousing Chicano solidarity with the Black Panther movement and AIM, representing the Northwest Chapter of the latter as a co-founder of the Centro Cultural de la Raza in Seattle where he settled after a permanent release from la pinta. Part of his prison time had, in fact, been shared concurrently with Peltier, considered by many to be a political prisoner innocent of the crime for which he was jailed, inside the U.S. Federal Penitentiary in Marion, Illinois. Back on the streets of East Austin, his childhood stomping grounds, Raúl became an honorary tío and literary padrino for many of us. Unsurprisingly, it was Raúl—AKA “Autumn Sun” in native communities that welcomed him as a warrior and a relative—who led the sweat lodge ceremony occasioned by my 18th birthday. He was also the one who turned me on to poets Luis J. Rodriguez and John Trudell, introducing me to both, personally, in 1991 and 1992, respectively. Resistencia Bookstore, home of Raúl's Red Salmon Press, eventually became my second home. And for a time I assumed the wheel of Raúl’s small pick-up, or “the rez truck,” as he called it, in which we loaded books to sell at book festivals and the poetry readings we organized together in cantinas and beer joints. It also took us on slow cruises through the old neighborhoods where he would point out homes and landmarks recalled from his life before the prison years when, as a young pachuco in the ’50s, he was known to the veteranos as “Tap,” short for Tapón. By the time I became a regular fixture at the bookstore, my sister Patricia had finished high school and begun college but had taken a break to pursue projects as a political organizer around native women's rights. She was also was a full-fledged danzante and traveling in Mexico for danza ceremonies based on Mexica and Chichimeca traditions. It wasn't long before she was hired to run a cultural center on the Texas-Mexico border in Brownsville called Casa de Colores. Two years later, she followed a vision received in ceremony, making her way to El Paso to train as a partera, after which she accepted an invitation from the Six Nations Birthing Center in Ontario, Canada to help develop its first-ever aboriginal midwifery program and train a new generation of indigenous baby-catchers. My nephew “Tayo,” short for TA-tanka YO-tanka, was just a toddler when he, his older sister and their mom moved to Mohawk country. So the call I felt went beyond a mission to gather source material for a story. 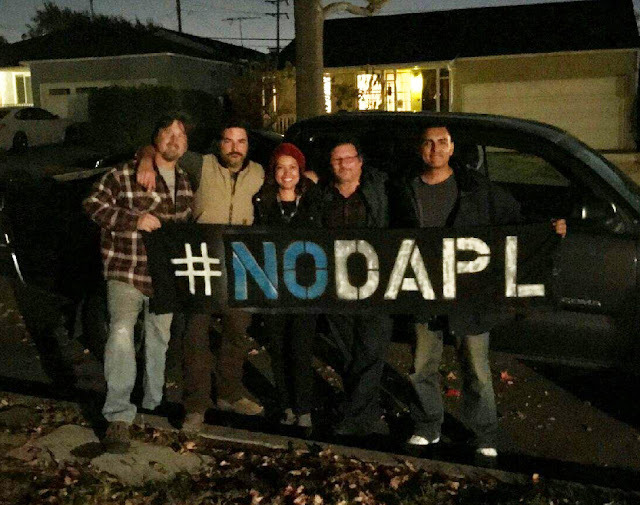 It was more, I believe, than merely a powerful compunction to stand with the water protectors. It was elemental, resonating in my DNA as a function of molecular memory and a lifelong link, through family and the poet-mentor, to something I don’t know yet how to fully describe. In L.A. again after an intense, unforgettable experience at Standing Rock, the death-defying journey there and a grueling drive home, I am--even as I write these words--still unable to completely explain the clear-as-a-clarion call that shook me loose from a dark, three-year slumber, sending me into the freezing Utah, Wyoming and Dakota winds just days before Nov. 25th. Despite a legally binding agreement I'd signed to vacate the Medford Street warehouse where I'd been holed up for almost four years by the 1st of December and clueless as to just how I would be putting an uncertain—but significant—distance along some undetermined, unfamiliar route between myself and Los Angeles, I was beset by a strange, peaceful calm. On the Sunday preceding the annual “Thanks-taking,” as the day is ominously called by many with indigenous sympathies, I knew everything would work out, that it was all going to be okay. You would think I’d secretly discovered a previously inert ability to teleport. “Aren’t you going to at least start boxing your stuff,” someone asked with regard to my eviction notice. “How are you getting to Standing Rock? Are you flying?” asked someone else. “You do realize Thanksgiving is this Thursday, right?” remarked a well-known Chicana artist at Tonalli Studio on Avenida Cesar Chavez. Dr. Elena Esparza, a much-in-demand healer and practitioner of traditional medicine, offered to donate warm clothes and organic herbal-based medicinal tinctures and remedies for cold weather symptoms and body aches, once I figured out if and how I could actually deliver them. My friend Rhett Beavers offered a sleeping bag and advice on dealing with law enforcement in North Dakota in the case that I was successful in finding transportation there. Later that night, a Facebook response from Aura Vasquez, an organizer and activist who I’d never met or even heard of until then, informed me that there was room for one more person in a two vehicle caravan headed to North Dakota with camp supplies and donations on Tuesday. I’d been put in touch with Vasquez by long-time friend Susana Sandoval, a poet and community organizer from Chicago on her second tour through the camp site at Standing Rock. It seems my gut had been right. I was on my way. A Tuesday departure would put me in the principal water protector camp by Thanksgiving, and my instincts told me that the cosmic forces were once again aligning in my favor. While unsure I deserved such palpable intervention on my behalf, my over-worked guardians were making it very clear: Standing Rock was where I was supposed to be. And though I didn’t know it yet, they would be required to intercede once more, in a shockingly drastic way, to ensure that I completed the journey to Oceti Sakowin.